Two young accomplished dancers,Samantha Benedetti and Giovanni Panasiti, the tappers of Michela Bianco’s school of dance and the vocal trio “ Les Babettes “ often cooperate with the TEJO. The pieces are introduced by Livio Laurenti in a logical thread enabling the audience to immerse in the times and better savour some gems of early jazz.With its gaiety and ease of listening, the musical genre will appeal to everyone. Consistenly with its philological approach, TEJO employs little or no amplification at indoor concerts. 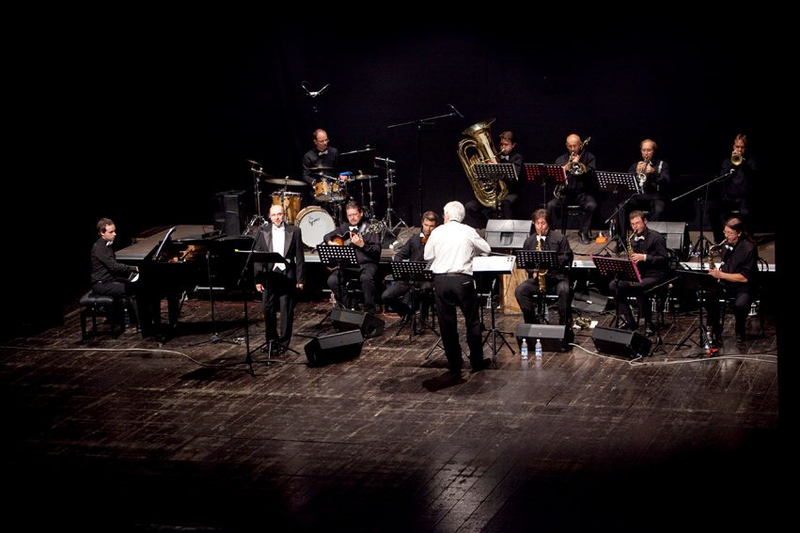 *The following musicians have cooperated: Antonio Kozina (violin),Giuliano Tull and Giovanni Cigui (alto sax),Maurizio Cepparo,Alessandro Maras,Miron Hauser and Max Ravanello(trombone),Francesco De Luisa (piano),Marco Steffè and Fulvio Vardabasso (guitar),Franco Feruglio (bass),Paolo Muscovi and Gabriele Petracco (drums).